The oldest part of Mignon house dates back to the beginning of 17th century. However, this place has always been popular due to its proximity to the hot springs. 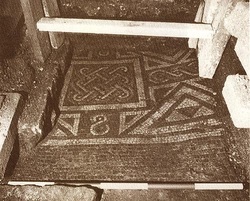 The site of a Roman Villa, a section of its decorative mosaic floor was found in the cellar of the neighbouring Crystal Palace pub in 1984. In the Middle ages the Bishops Palace was built on the plot where Mignon house now stands. After the Reformation Edward Colhurst bought the Priory site and gave the Abbey Churchyard to the City in 1572. Savil and Speed's map c.1600 pictured a house which later became known as Mignon but it was not until 1755 when the house got its Georgian facade and its French name.